Tieline's mission is to empower you with the technology to go live where no broadcaster has been before, and make it simpler. ViA delivers 6 IP interface options, making it simpler to go live than ever before. Connect over IP with dual Ethernet LAN ports, or 2 USB modems, or an internal LTE module, or use built-in Wi-Fi. There's no need for an external Wi-Fi modem and you can connect to access points in seconds. Stream using a cell-phone Wi-Fi hotspot, or connect to hotels and other public Wi-Fi access points using the integrated web-portal in a snap! 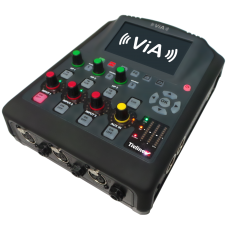 ViA is the only remote codec that supports IP, ISDN and POTS, plus data aggregation and redundant IP streaming. Insert an optional POTS or ISDN module and the codec is instantly transformed to connect over alternative network transports. This means you can configure primary and backup connections over different network transports as required, or use them as your IFB circuit. Stream live audio and view and manage recordings, create playlists of local and imported files, then control playback routing to encoders and analog and digital outputs. Produce & record your own broadcast quality podcasts to removable media. ViA delivers all the flexible transport options you would expect from a professional codec. Select wired or wireless IP options, or choose to connect over ISDN or POTS. A rechargeable Lithium-ion smart battery delivers up to 6.5 hours of broadcast time. Extend battery performance with features such as screen sleep time-out, screen brightness controls, plus automatic low battery power saving measures. Built-in Wi-Fi connectivity and an integrated web portal expands your connection options from access points in hotels, fast food chains, or even a smartphone’s Wi-Fi hotspot. Add Wi-Fi access points in seconds and stream program audio or your IFB circuit. ViA supports many pre-tested cellular USB modems out of the box. Insert a modem into a USB port and you're ready to go live in seconds! Bond data from modems with Fuse-IP, or use 2 modems with SmartStream PLUS dual redundant streaming. Restrict user access to complicated network settings and take the hassle out of broadcasting forever. An administrator can configure 'Basic Mode' to simplify operation and present a subset of menus suitable for non-technical users. Configure the codec to automatically power-up in basic mode, then tap a program to go live in seconds. Imagine the peace of mind knowing you can bond 2 cellular data links from different Telcos and let Tieline’s Fuse-IP technology automatically manage the data capability of each link! Tieline understands flexibility is paramount for remotes, so you can even bond a USB modem with a Wi-Fi connection, or bond Ethernet connections. ViA also includes Tieline’s SmartStream PLUS dual redundant streaming software, which has set the benchmark for redundant IP streaming over the public internet. Some manufacturers charge thousands of dollars for IP management software like SmartStream PLUS as an optional extra, however Tieline believes high performance and rock-solid reliability is an essential part of each and every broadcast, so you get it for FREE! With Tieline’s SmartStream PLUS and Fuse-IP technologies, as well as automated jitter buffer management and error correction strategies, you can be assured of trouble-free motoring on the information superhighway. ViA seamlessly integrates with Tieline’s Merlin and Merlin PLUS audio codecs to transmit high fidelity, full duplex stereo program audio with a separate bidirectional IFB circuit. As an example, you could use a USB data modem to broadcast your main program feed and another USB modem or Wi-Fi to transmit your IFB circuit. Now that’s flexible! ViA delivers the ultimate in flexibility by allowing any input to be routed to any output using the simple touch screen Matrix Router. The codec also supports saving, renaming and loading custom matrices. Customize Cue and Talkback functionality to easily route communications audio locally, or to the studio. Announcers can customize headphone monitoring using the simplest headphone monitoring interface imaginable. Tap the touchscreen to select and deselect input sources in real-time. Save setup time by recalling customized headphone mixes for different announcers in a snap! You can even customize audio routed to analog XLR and digital outputs, including output levels, send/return balance and output mute. 3 Analogue Mic/line inputs (input 1 supports stereo AES3 digital audio, or mono AES42 microphone). Stereo analogue line input and stereo digital in/out via micro-USB or S/PDIF. Record and playback capability with ability to create and import playlists of files and then edit playlists; customize playback routing and select sources to record.